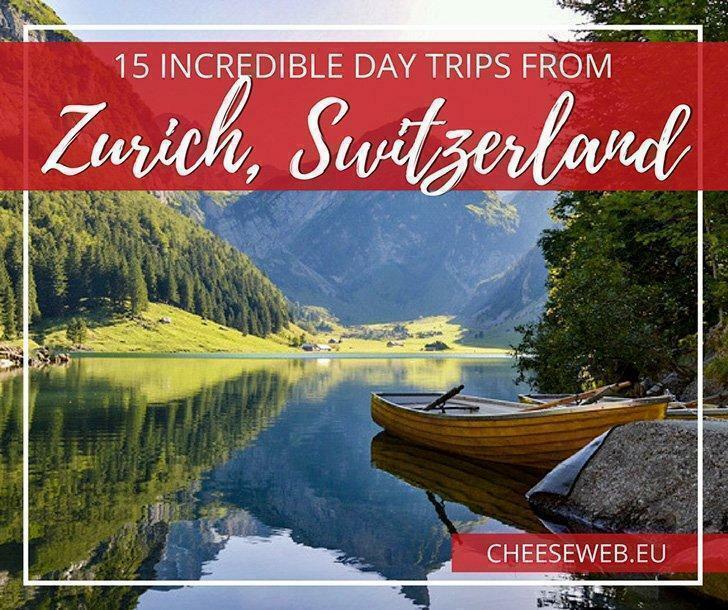 Our Swiss guest contributor, Seraina, shares 15 of the best day trips from Zurich, Switzerland to take you off-the-beaten-path within two hours of your home base. Have you ever thought about the definition of the phrase ‘day trip’? So starting in Zurich, apart from reaching every single corner of tiny Switzerland, you could technically also visit Milan, Paris, Munich, or even London; in just one day. 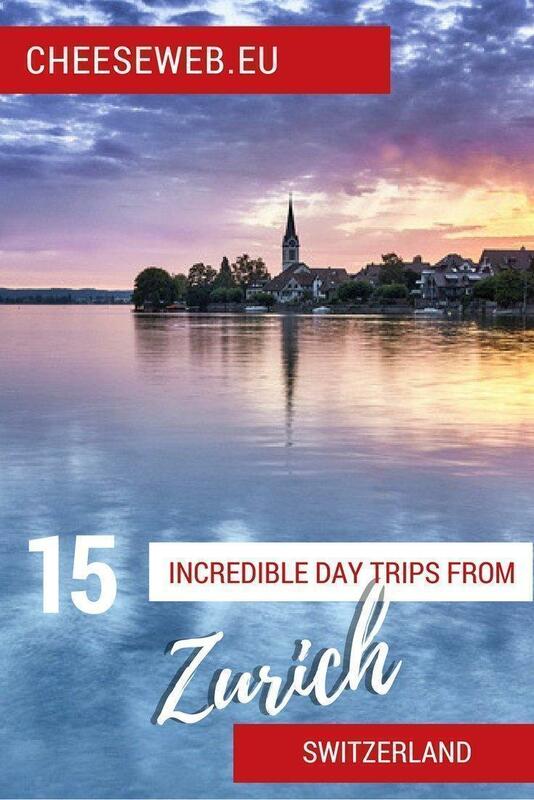 There are so many things to do near Zurich, Switzerland, you don’t have to travel far for a day trip. In agreement with this principle, all the day trips listed below take less than two hours to reach from Zurich by public transport. The stunning Atzmännig region offers something for everyone, all year round. Hiking, luging, living out your inner monkey at the climbing park, skiing, sledding or snowshoe walking are all possible activities in the area. The views are spectacular, too. The mountains of Glarus and the Linth plain are two highly instagrammable motives. Reaching Atzmännig from Zurich takes 1:15 hours. For people that aren’t interested in hiking, there’s a cable car leading to the top. 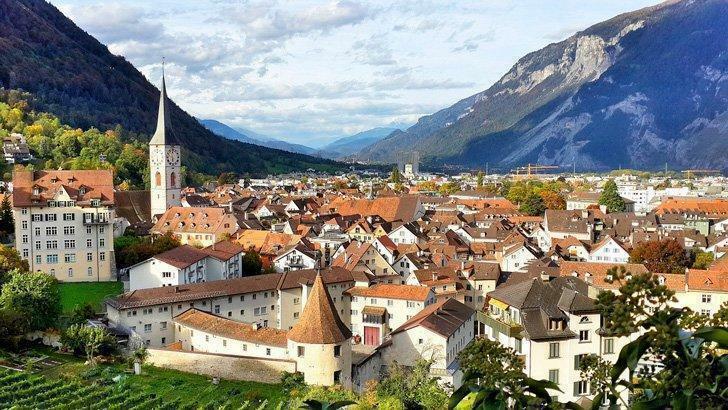 The pretty town of Rapperswill makes a lovely day trip from Zurich, Switzerland. On a day where the journey is the destination, catching a boat from Zurich Bürkliplatz to Rapperswil is a fantastic idea. This scenic trip takes just under two hours and offers plenty of photo opportunities. Rapperswil is a quaint little town by Lake Zurich. It’s the perfect place to stroll through hidden alleys, enjoy the view from the castle garden, visit the zoo and hang out by the lake. A wooden footbridge connects Rapperswil with Pfäffikon, a village on the other side of the lake. This footbridge joins a walking path halfway across the lake and is part of the Camino de Santiago trail. The ride back from Pfäffikon to Zurich takes half an hour. Or, if your day hasn’t been packed enough yet, the Wildlife Park Langenberg could be a great stopover on the way. Glärnisch Mountain viewed from the pretty town of Glarus, Switzerland. 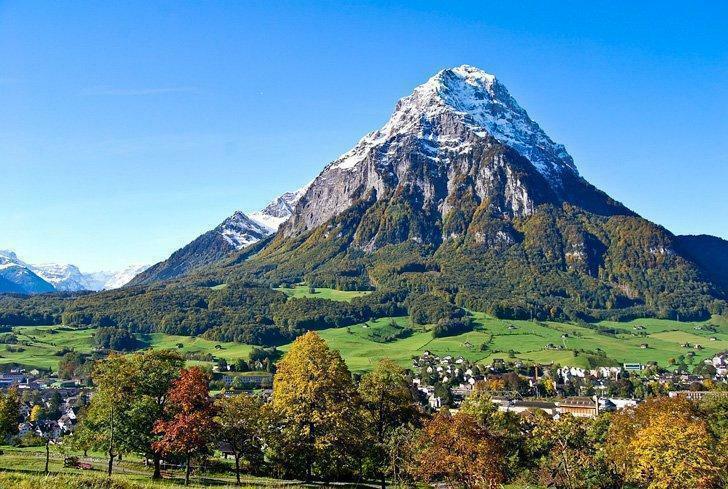 The village of Glarus is surrounded by towering mountains, making this whole area an excellent hiking destination. Not far from Glarus lies the Geopark Sardona, a UNESCO World Heritage site. This park is freely accessible all year round and offers tons of hiking trails. Probably the most popular trip is the ‘Expedition Tschinglen.’ This includes a gondola ride, a 1.5-hour hike, and world-class photo opportunities. Getting to Glarus takes one hour from Zurich. 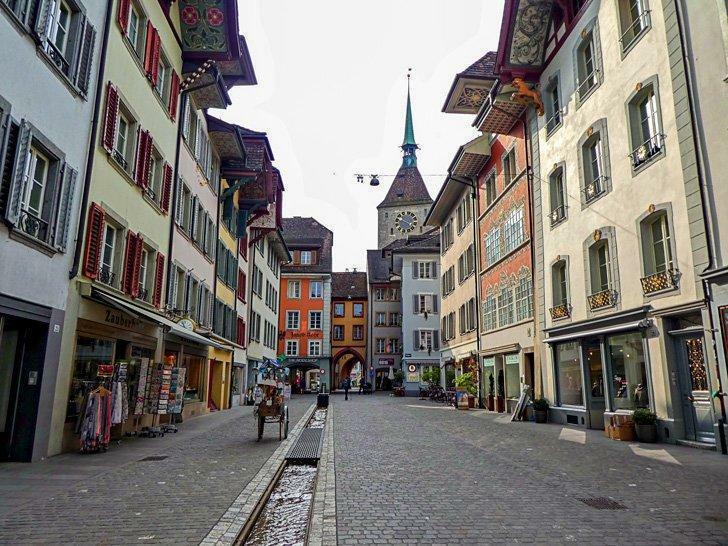 Churs, Switzerland’s oldest town is one of the great day trips from Zurich you can make in under two hours. Only a short train ride from Chur lies Trin, one of the starting points to visit Ruinaulta, the famous Rhine Gorge. This wild gorge impresses with raging waters, steep cliffs, and extensive forests. The train ride from Zurich to Chur takes 1:15 hours. 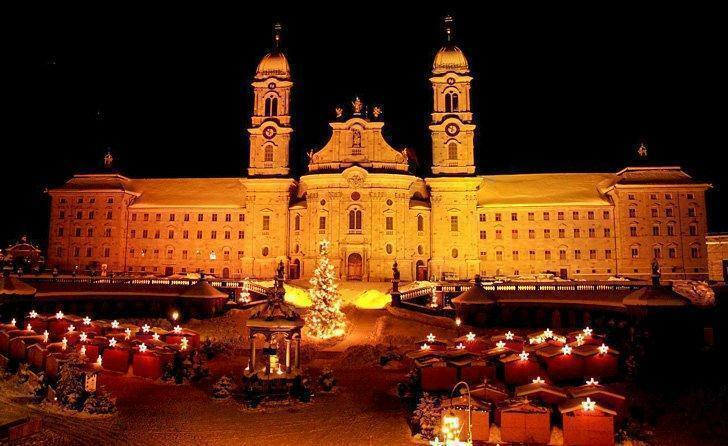 Einsiedeln Monastery hosts a stunning Swiss Christmas Market that is an easy day trip from Zurich. In the early 19th century, a massive rockfall struck the villages of Goldau and Röthen. This tragic event, which killed 457 people, shaped a fascinating and wild landscape. In 1920, a handful of animal lovers founded the Wildlife Park Arth-Goldau to reinhabit the area with native and foreign animals. Today, some of the park’s residents are caged, while others freely roam the walking paths and enjoy being fed by visitors. The train ride from Zurich to Arth-Goldau takes roughly 40 minutes. Another 40 minutes away lies the imposing Abbey of Einsiedeln. This magnificent, Catholic monastery is a significant milestone for many pilgrims walking the Camino de Santiago trail. The inside of the Abbey can be visited by joining a guided tour. The ride from Einsiedeln back to Zurich takes just under an hour. 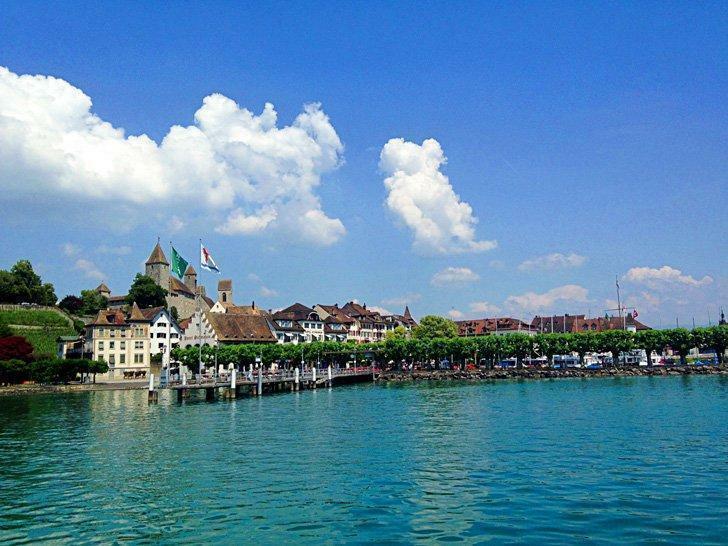 Add picturesque Zug, to your list of things to see in Switzerland. 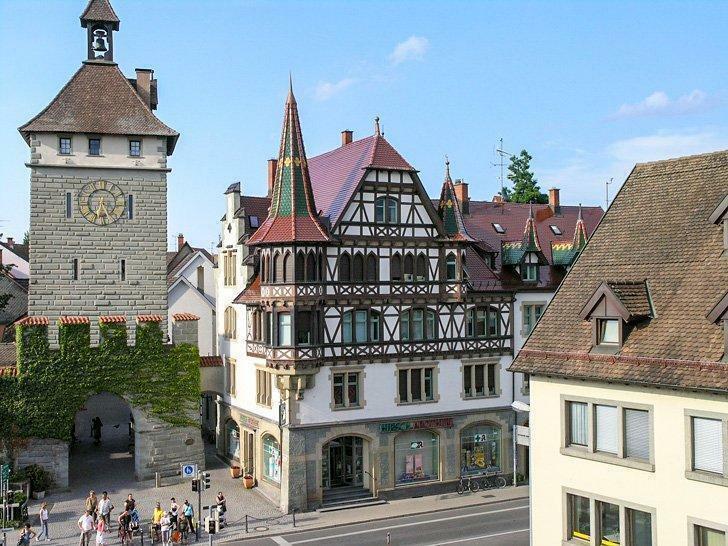 The city of Zug is built right by the lake and presents a picturesque old town with elegant historical buildings. To get a view of the Rigi Mountain and over the city, head to Guggishügel. For additional mountain views, catching the cable car up Zugerberg is another option. As a culinary treat, grabbing a slice of the typical, local pastry called Zugerkirschtorte is a must. But be warned. This delicacy is pretty much drenched in Kirsch and therefore not necessarily the right dessert for kids. The train ride from Zurich to Zug takes half an hour. 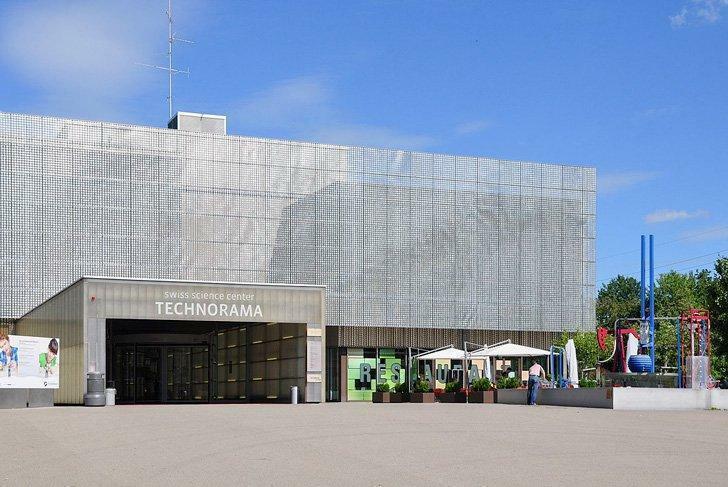 In the city of Winterthur, the Technorama educates people on everything related to science. Also known as the Swiss Science Center, it has over 500 experiment stations catering to everyone’s interests. Spending a whole day exploring the laws of physics, mathematics, magnetism, and electricity is a sure way to keep that grey matter of yours alive. 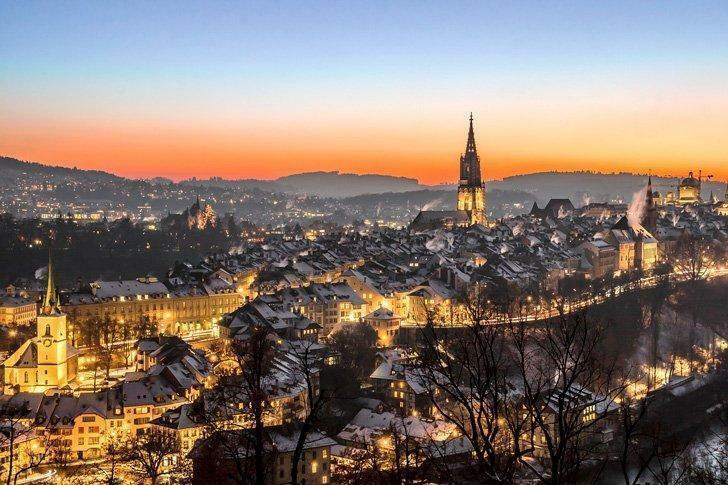 If not, the old town of Winterthur offers more than enough opportunities to grab a bite, relax in the park or go (window) shopping. Getting from Zurich to Winterthur takes less than half an hour. 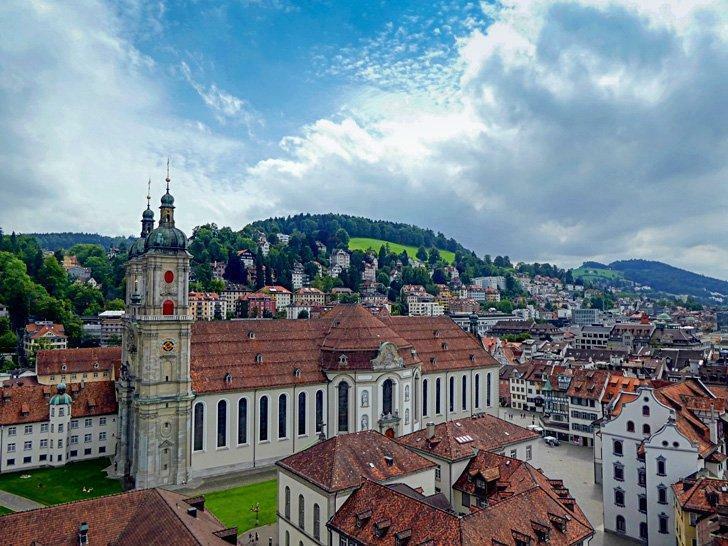 St. Gallen Switzerland is home to a UNESCO-listed Abbey. The city of St. Gallen in the east of Switzerland is famous for many things. There’s its historic textile industry, the charming recreational area of Drei Weieren (Three Ponds), the Unesco-listed Abbey district with its cathedral and the Abbey library, which hosts over 170.000 books that are in part handwritten and over 1.000 years old. The Mühleggbahn, St. Gallen’s oldest means of public transport, takes people up and down the Mühlenenschlucht, a gorge right behind the Abbey district. This 90-second ride is a whole adventure in itself and also the easiest way to reach the Drei Weieren. The train ride from Zurich to St. Gallen takes just over an hour. 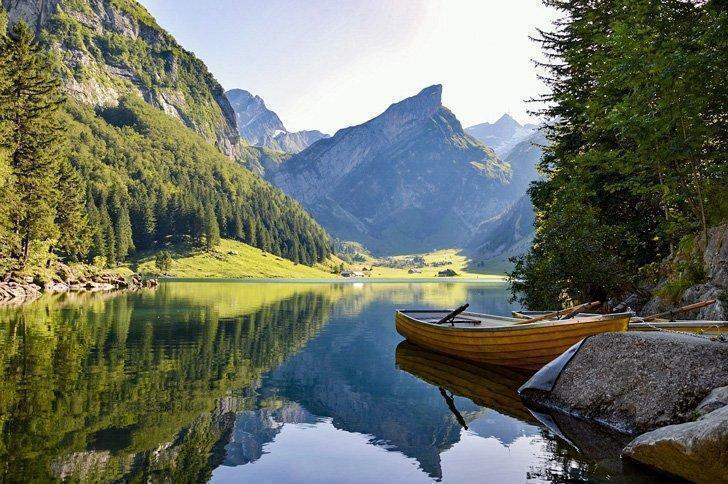 Hiking in the Alpstein Mountain Range makes for an unforgettable Zurich day trip. The Alpstein Mountain Range in the east of Switzerland is perfect for hikers as well as lazy bums. Its highest peak, the Säntis, towers at 2.502 metres above sea level, which isn’t all that high in comparison to the rest of the Alps. But since the Säntis is so isolated, its high alpine climate is as rough and unpredictable as that of a 4.000-metre peak. Getting up there is easiest by cable car from the Schwägalp. Hiking to the top is possible too, but only for experienced hikers with suitable footwear. Alternatively, the Kronberg also offers magnificent views of the whole Alpstein range. Since it’s more of a big hill than an actual mountain, hiking up is less exhausting and dangerous than the Säntis. There’s a cable car going up, too. The ride to the Schwägalp takes 1:50 hours. Jakobsbad, where the journey to the Kronberg starts, is 1:40 hours away from Zurich. Sunrise over Lake Constance, makes an unmissable day trip from Zurich. Lake Constance is Central Europe’s third biggest lake and forms the border between Switzerland, Germany, and Austria. Due to its size and shape, the opposite shore isn’t always visible, which is why it carries the nickname Swabian Sea. Along the coast, public bathing beaches, walking and biking trails, towns and villages with delicious ice cream offer plenty of opportunities to linger or take a walk. Depending on your destination, Lake Constance will take between 1:10 and 1:30 hours to reach. The German town of Constance or Konstanz has a charming old town center. 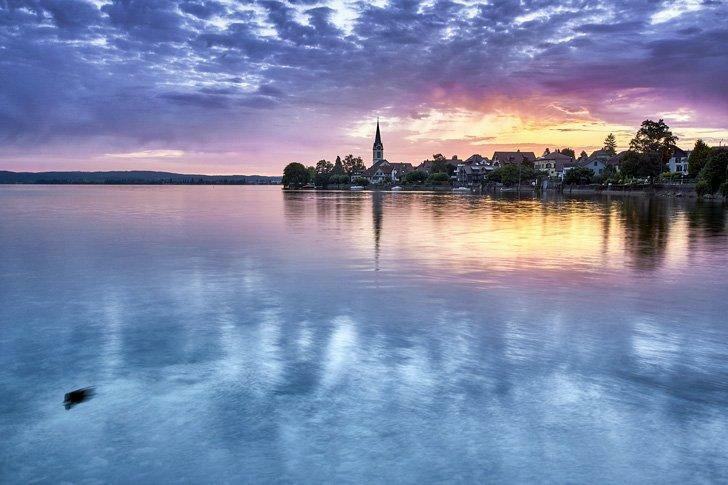 As the name suggests, Constance, or Konstanz, is a delightful German city on Lake Constance. It’s as popular for its massive Sea Life Aquarium (Book your tickets here) as it is for greedy Swiss shopping tourists who like a cheap buy across the border. However, if marine creatures and shop-till-you-drop sessions aren’t your cup of tea, the city centre offers plenty of ice cream stands, enticing alleyways and cosy places by the lake to spend the day. Getting to Constance from Zurich takes roughly an hour. 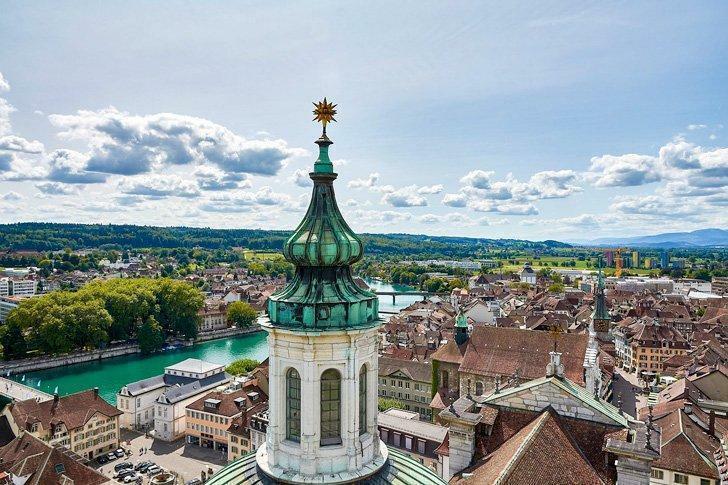 It’s easy to visit the beautiful capital of Switzerland Bern from Zurich. While in Bern, strolling through its UNESCO-listed old town, checking out the federal parliament building, and saying hello to the bears at the bear park is a must. The Gurten, a hill right next to Bern, and the Rosengarten offer fantastic views over the city and into the Bernese Alps with their snow-capped mountains. An absolute highlight during summer is hopping into the Aare River and floating downstream. Bringing a plastic bag will help keep your clothes dry while you’re on this floating adventure. The fastest train ride from Zurich to Bern takes just under an hour. Picture-perfect Solothurn, Switzerland is an easy day trip from Zurich. Solothurn is Switzerland’s most beautiful baroque city. Apart from the old town, the Verenaschlucht with its little hermitage, the Weissenstein (the locals call it a mountain, I call it a hill) and the Aare River make Solothurn a great destination to visit. There are 11 fountains, 11 museums, and 11 churches/chapels in the city. Inside the St. Ursus Cathedral, there are 11 bells, 11 altars, and the cathedral took 11 years to build. There’s a clock with only 11 hours and a beer called 11. The list goes on. And nobody knows where this obsession originates; not even the locals. Maybe you’ll figure it out. The train ride from Zurich to Solothurn takes just under an hour. Aarau, Switzerand’s Old Town centre. The Chocolat Frey Visitor Centre in Buchs AG, a village next to Aarau, is a dream for every chocolate lover. Apart from tons of information about the making of Switzerland’s most famous confectionery, there’s also an all-you-can-eat conveyer belt loaded with different types of chocolate; and let’s not forget about the two chocolate fountains! After this high-calorie excursion, the old town of Aarau and the free Wildlife Park Roggenhausen are suitable places to recover from a potential endorphin coma. The train ride from Zurich to Aarau takes half an hour. Schloss Aarburg is one of the many castle of Aargau you can visit on a day trip from Zurich. The Canton of Aargau is well-known for its numerous castles and ruins. Out of the 40-some castles, 23 are publicly accessible. 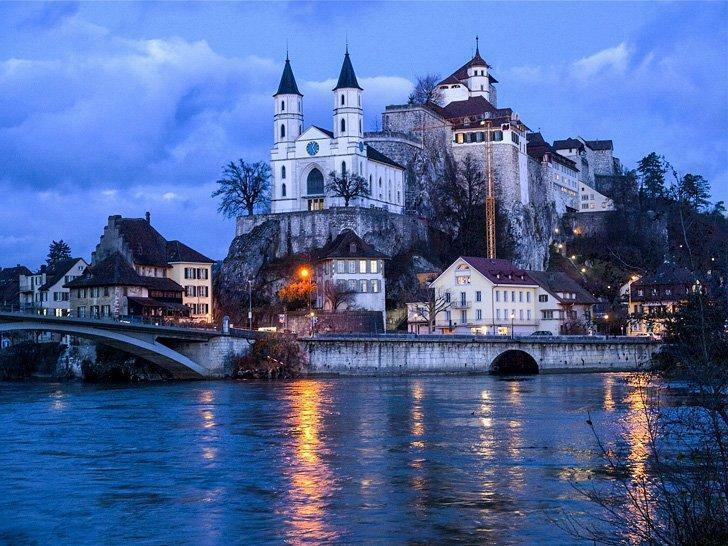 The most famous ones are Schloss Habsburg, Schloss Lenzburg, Schloss Wildegg and Festung Aarburg. Although, unless you’re a juvenile delinquent who lives there, you won’t be able to visit that last one in Aarburg. Since these sites are all in different parts of Aargau, they can take anything between 20 minutes and 1:20 hours to reach. I guess you can see why the Swiss have their own interpretation of a day trip. So many places are accessible within a short amount of time. Stretching this time frame any further would leave everyone overwhelmed with an endless choice of things to do in Switzerland. And since Zurich is Switzerland’s biggest city, there’s plenty enough to explore without even getting on a train. If you plan to do a lot of Zurich sightseeing pick up your Zurich Card to save on attractions, dining, and transportation. If you are touring extensively in Switzerland, the Swiss Coupon Pass offers 100 discounts in 11 destinations. You can order a Print Coupon Book or get the Digital Pass. Both last an entire year. Seraina Zellweger is a devoted budget traveller who’s been around the world and back. 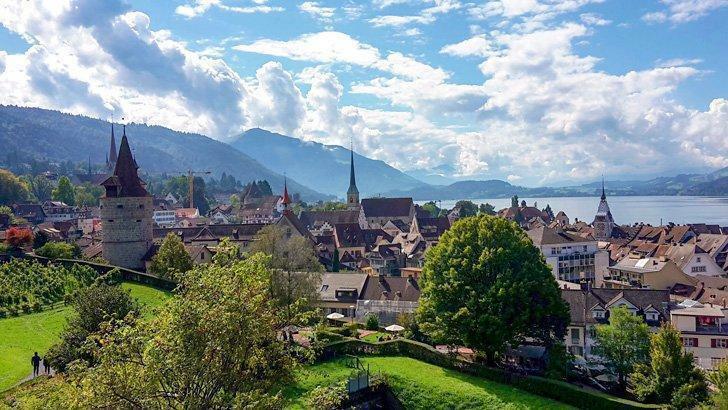 As a native Swiss, she’s made it her mission to give fellow backpackers tips on how to visit Switzerland on a shoestring. Find out how you can stretch your travel cash by downloading her free guide, 10 ways to save money on food in Switzerland.